The new blasting system cleans and separates the media just on the inside of the cabinet's hopper, saving up to 30% of the abrasive. The suction is indefinitely adjustable for each type and size of blasting media. The high-performance filter cartridge, with a dust-trap-rate of 99% inside the enclosure, traps particles down to 1.0 micron. 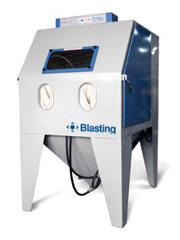 To improve the performance of Blasting blast cabinets the use of the optional automatic cleaning is recommended. The new filter located on the inside of the enclosure guarantees the absence of extraction dust in the environment. An optimum visibility is guaranteed by the new extraction system and the light module inside the cabinet.